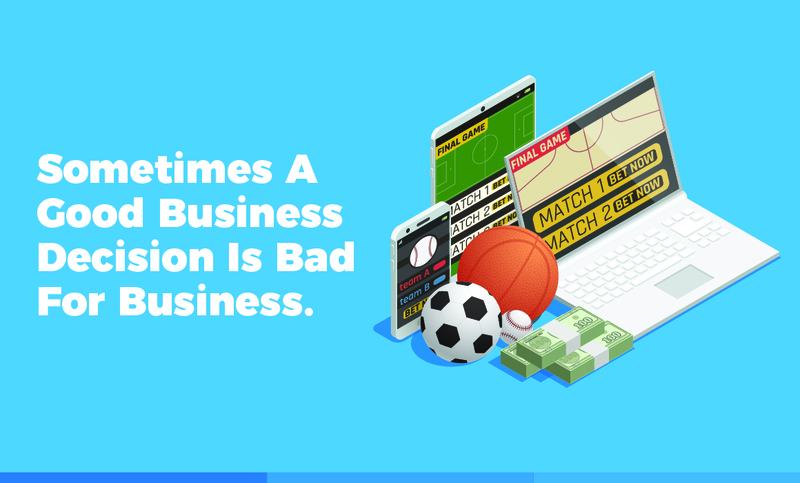 Last week fantasy sports site FanDuel learned that sometimes the right financial decision is the worst decision for business. After the Supreme Court ruled that states could allow sports betting, FanDuel was one of the daily fantasy sites that opened a sportsbook – a place for people to place bets on sports – for New Jersey residents. Last weekend, an 18-second glitch in FanDuel’s sportsbook software showed a Newark man 750-1 odds on a game. That meant his $110 bet had a payoff of $82,000. He won and expected his winnings. FanDuel said, no, read the manual – when a glitch offers incorrect odds, FanDuel can determine what the odds should have been and offer those winnings only. Instead of the erroneous payoff, FanDuel offered their customer $500 and skybox seats to three New York Giants games. He didn’t take this well and the situation quickly became a national story. FanDuel is technically correct; this is standard operating procedure for sportsbooks. Paying out $82,000 on a wager that really should have paid $18 because of a software glitch would be bad for business. But what’s worse for their business is getting bad national press and being hammered on social media. That’s potentially a greater loss than the $82,000 payout. FanDuel also lost an opportunity to spin the story into positive coverage of a company’s largesse and commitment to its users. State regulators got involved and FanDuel eventually decided to make the full payout from its 18-second glitch. But what did this episode ultimately cost them in perception and brand equity? Any business will live and die with its customer base, the people who return again and again and ultimately attract their friends and acquaintances as new customers. Goodwill may cost a lot in the short term but it’s priceless in the long run. So if your business finds itself in a duel with its fans, remember that your financial calculation needs to take reputation and brand equity into account. Want to talk about applying design thinking to your business practices? Email me or call 317-631-6400.